Got a question or comment about CityTours in Madrid? Ask a Travel Expert! 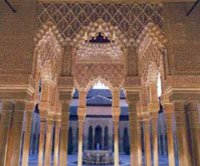 Head on out of Madrid and spend four days exploring Andalucia's most popular cities: Seville, Cordoba and Granada. You'll visit several UNESCO World Heritage Sites including the Alhambra and discover the rich history of this beautiful Spanish region.Departing Madrid, you'll travel through the legendary country of Don Quixote to reach Cordoba. Your city tour of Cordoba's mosque/cathedral and Jewish quarter will reveal a beautiful network of streets, alleys, squares and whitewashed courtyards, reflecting the importance of the city in the medieval period.Next, it's on to Seville to take a tour of the beautiful city's many highlights, including the cathedral, gardens and Santa Cruz quarter. Built on the banks of the Guadalquivir River, lively Seville has a rich Arab legacy and colorful local districts such as Triana and La Macarena.After some free time in Seville, your tour continues to Granada to see the amazing Arab architecture of the Alhambra, last stronghold of the Moorish kingdoms until 1492 and one of Andalucia's special highlights.Your tour also includes a visit to the World Heritage city of Toledo before returning to Madrid. You'll discover a glorious city filled with amazing medieval architecture, and take a walk into the past along its cobblestone alleyways. Click here to find out more about this deal! Soak up Spain's sensational history on a day trip to Avila and Segovia. With the option to indulge in a gastronomic lunch, this trip is a feast for all the senses!On your day trip from Madrid, you'll stop at hilltop Los Cuatro Postes to admire superb panoramic views before visiting Avila's San Vicente Basilica. Tour also includes a visit to Avila's cathedral. Ancient hill-top Avila has been declared a Unesco "Heritage of Mankind" city, and is famous for its intact city walls and 90 towers dating back to the 11th century. The city was the birthplace of the mystic writer Saint Teresa of Jesus (1515-82) and is an important pilgrimage site. Next, it's on to Segovia to see one of the best Roman-era monuments on the Iberian Peninsula - Segovia's incredible aqueduct. Built in the time of Augustus, the aqueduct has 118 arches and is 10 miles (16 kilometers) long, although just a fraction of its length remains visible today. Segovia is also famous for its Alcazar, a beautiful 11th-century medieval fort that inspired the design of the Disney castle. Step back in time and imagine the medieval tournaments that once took place and the heroic knights who fought here. On this day trip you have the option of including a tourist-style lunch or superb gastronomic lunch featuring local Segovian specialties. Click here to find out more about this deal! Spend a morning, afternoon or full day in Toledo, Spain's medieval capital and a treasure trove of El Greco artworks. You'll discover a glorious city filled with amazing medieval architecture, and take a walk into the past along its cobblestone alleyways.A highlight of any visit to Toledo is seeing the famous paintings by the 16th-century master, El Greco. Toledo was the setting for many of El Greco's artworks, and a tour highlight is The Burial of the Count of Orgaz in the church of St. Tome. Toledo is a National Monument to Spain's art and history, combining Arabic, Mudejar Gothic and Renaissance architecture. 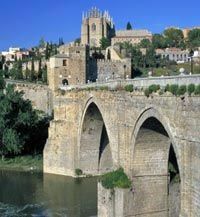 Surrounded by the River Tajo, the atmospheric walled town is crammed with churches and museums.Tour highlights include the amazing 13th-century cathedral, the medieval castle and Santa Maria La Blanca Synagogue. YouÂ’ll also visit St. Tome Church, San Juan of the Kings and the Victorio Macho Museum. If you choose the full-day tour, your visit includes a panoramic tour of Toledo. Click here to find out more about this deal! Take your time with five days to explore some of Spain's most famous cities. With Moorish Kingdoms in Granada, thriving resorts of the Costa del Sol, and the many UNESCO World Heritage sites in Cordoba, Seville and Toledo, this is a tour deep into the heart of Andalucia.Andalucia is one of the most attractive areas within the Mediterranean regions, due to its mild climate, environmental nature, its history and culture. It was consecutively conquered by Phoenicians, Greeks, Carthaginians and Romans, later by Vandals and Suevians, before the Arabs occupied the region during five centuries. Toledo is a city that once visited, never ceases to rest in the imagination. The fortified medieval city built on a hill overlooking the Tagus River, is without a doubt one of the densest monumental cities in the world. It also lies claim to being the hometown of Spanish artist El Greco and houses many of his famous works.At the foot of Sierra Nevada, between the Darro and Genil rivers, lies Granada. The last city reconquered in 1492, Granada has a distinctly Arab influence with the impressive UNESCO World Heritage Sites of Alhambra and Generalife Gardens amongst the highlights.Ronda is one of the most popular tourist destinations in the Andalucia region and you will join a sightseeing tour of this beautiful town of Celtic origin. With the Cathedral (Roman, Arabic and Gothic styles), the Old Quarter, the Bull Ring (oldest one in Spain) and the magnificent Tajo Gorge, Ronda has plenty of sites to discover during your time there.Built on the banks of the Guadalquivir River, Seville displays a rich Arab legacy. Every street and square that makes up the historic quarter of the Andalucian capital bursts with joy and activity. Click here to find out more about this deal! 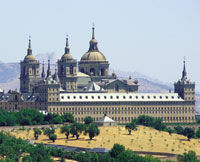 Experience the grandeur of the El Escorial monastery on a guided half-day trip from Madrid. Afterwards, visit the poignant Valley of the Fallen monument erected in memory of the millions who died in the Spanish Civil War. Gain insights into Spain's intriguing history at these symbolic monuments reflecting the Spanish monarchy, church and 20th-century conflict.The Royal Monastery of San Lorenzo El Real was built by King Philip II to house the remains of his parents, Charles I and Isabella of Portugal. The austere Renaissance complex combines a palace and monastery, and features a wonderful collection of art. On your visit, an experienced guide will take you for a tour of the complex, including the Pantheon of Kings and basilica. Located six miles (9.5 kilometers) north of El Escorial lies the Valley of the Fallen, a vast basilica built into the side of a mountain and topped by a gigantic granite cross. The monument was built by the Spanish dictator General Franco to remember the dead of Spain's Civil War. You'll take a guided tour inside the basilica, and admire the spectacular valley landscape surrounding the complex. Click here to find out more about this deal! Madrid is crammed with art galleries, museums, royal palaces, flamenco shows...and you'll see them all with the Madrid Card and save money! Choose between a 1-day, 2-day or 3-day pass, and gain prioritized access to Madrid's big four attractions: the Prado Museum, the Royal Palace, the Thyssen-Bornemisza Museum and the Reina Sofia Museum.SAVINGS WITH THE MADRID CARD INCLUDE: Free admission to more than 40 of Madrid's museums Take as many journeys as you wish on the hop-on/hop-off Turistic Bus Take all the tours from Discover Madrid program Take the Santiago Bernabeu Stadium guided walking tour Admission to the Madrid Amusement Park (72-hour card only), Zoo-Aquarium, Cable Card, Faunia Theme Park and Imax Cinema Discounts in shops, restaurants, flamenco shows and leisure centers Click here to find out more about this deal! Get a unique view of Madrid aboard this open-top double-decker bus. There are two tours covering all of the city's highlights, from historical sites and monuments to the modern Madrid of skyscrapers and cosmopolitan architecture. The Madrid City Hop-on Hop-off Tour enables complete flexibility to hop on and off as many times as you like aboard this open-top double-decker bus. With the choice of either a one or two day pass, this is a fantastic way to see all of the major sights Madrid has to offer the visitor.Features of the Madrid City Hop-on Hop-off Tour include: Anatomical seats Open-top buses for an incomparable view Adapted for passengers with reduced mobility Multi-language audio-guides: Spanish, English, French, German, Italian, Japanese, Portuguese and Russian Environmental commitment: Diesel Euro III engines (EURO 3 standard on particle emissions) and 100% recyclable aluminum bodywork Route 1 - Historical Madrid (75 minutes)Philip III and Philip IV enlarged and embellished the city but the Bourbons brought new cultural and architectural tastes. It is to them Madrid owes the spectacular Royal Palace, the Paseo del Prado and the Puerta de AlcalÃ¡. A drive down the Gran VÃ­a, the capital's most important road during the first half of the last century, gives us an insight into its unique architectural diversity and outstanding examples of the Belle Epoque, such as the Casino de Madrid and the Palace Hotel.Route 2 - Modern Madrid (75 minutes)The 19th century saw Madrid expand. The Salamanca neighborhood was built, a residential area and the site of the first bourgeois homes. The Paseo de la Castellana was developed, where the city's palatial mansions give way to modern skyscrapers of great architectural value, and which are a testament to Madrid's position as one of Europe's most cosmopolitan, attractive and modern cities. Click here to find out more about this deal! Travel throughout the region of Madrid with ease with your Madrid Tourist Travel Pass. With this pass you are entitled to use all public transport services with unlimited use within the period of validity. 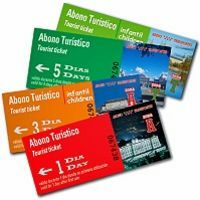 You can choose from 1, 2, 3, 5 or 7 days for either Zone A, taking to the main museums and sights in central Madrid or Zone T, covering central Madrid as well as Toledo and Guadalajara.Zone AUnderground - All metro lines within the zoneUrban Buses - All EMT routesSuburban Trains - All RENFE suburban trains within the zoneLight Rail - ML1Zone TUnderground - All metro lines within the zoneUrban Buses - All EMT routesInterurban Buses - All lines of Regular Passenger Public Transport by road, within this zoneSuburban Trains - All RENFE suburban trains within the zoneLight Rail - ML1You will also receive instructions on how to use your pass and a map of Madrid showing bus routes, the underground and train network as well as places of interest. Click here to find out more about this deal! Sample Spanish nightlife and Madrid's tasty tapas on an evening walking tour that will tantalize your taste buds! Led by an entertaining foodie guide, this walking tour is the best introduction to the laid back Madrileno lifestyle. You'll visit Madrid's tucked-away corners and feast on tasty treats you would never discover on your own, leaving you with a lasting feeling for Madrid and its people, and an appetite for its fabulous food and drink!On the walking tour you'll visit four traditional bars/restaurants to try authentic Spanish delicacies. It might be chorizo in cider, octopus from Galicia, cider from Asturias, sherry from Andalucia or other regional specialties. The tour price includes your first drink and tapas at the first bar you'll visit. You can then choose how much or how little you'd like to eat and drink at the other bars/restaurants you'll visit on the evening walking tour. For a satisfying night out you should expect to spend about 30 to 35 euros per person. Along the way, your English-speaking guide will explain the traditions behind Madrid's food and wine, and advise on local specialties. Your local guide will also assist with language and translation, while providing interesting facts about Madrid's history, culture and customs. As the average maximum group size is six people, you will enjoy a unique personalized experience on this special evening walking tour of Madrid's fabulous tapas bars and restaurants. It's the perfect way to discover local insights, while sampling traditional food and drink in great company. Ultimately, adding more color and flavor to your Spanish sojourn! Click here to find out more about this deal! 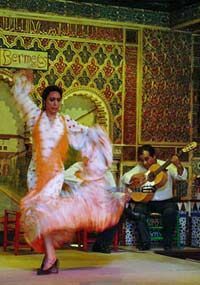 Feel the heat of Spain's traditional dance at the legendary Torres Bermejas, where some of the greatest names in flamenco have performed. You will be entertained by an internationally renowned flamenco group of more than 20 artists, making your visit a night to remember.The famous Torres Bermejas club features a unique decor, reproducing the grandeur of the Alhambra in Granada. While being entertained by a fabulous live flamenco show, you have the option of enjoying a drink, or why not go for the dinner option? A typical meal might include a welcome glass of sherry, Andalucian gazpacho, Spanish omelet, paella, fish, flan, coffee and cava (Spanish champagne), wine or sangria and mineral water. Click here to find out more about this deal!